Camera bags are available in pretty much every shape, colour and material you can imagine and there is a lot of choices. To try and make things easier for you, we've created this guide so you can click on the type of camera you have or the type of bag you want below, and look what's available. Where possible, we've included bags tried and tested by ourselves, so we can vouch for their performance. For your compact camera, you might want something with a hard shell to protect it from bumps and scratches whilst stowed in a larger bag, a neoprene case or something with a belt loop, enabling you to secure it to your person. These bags are a classic for compact cameras. They are available in 4 different sizes and come complete with an all weather cover and shoulder strap. They also have a belt/bag loop, so you can attach your compact to your person or to a bag. They're well padded and have a hard rubber bottom to minimise wear. Inside there is a pocket for a spare memory card, and a mesh pocket for other small accessories. If you want a shockproof, supercompact case that's simple yet effective, then a neoprene case will be for you. These cases are great for if you want to stow your compact in a larger rucksack or handbag, as it'll keep them scratch free. Plus, when you take your camera out to shoot, these bags a super squishy and foldable, making them easy to stow away into a pocket while you're shooting. There is a detachable wrist strap included, lessening the chances of accidentally dropping the camera. If you're style conscious and still want to protect your compact then the Acme Made Sleek Camera Case is well worth a look. Available in several colour options including purple, red and spotty, the case has a hard shell for protecting the camera and this also gives it a shiny effect that's not seen on many other cases. 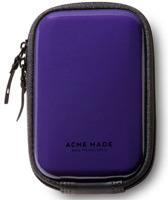 Inside there is a soft inner lining and the case has a clamshell design for easy access. Bags for bridge or ultrazoom cameras tend to be top loaders, IE you have to undo the top to access the camera, which is usually stored lens down, making it easy to grab the camera and take images. 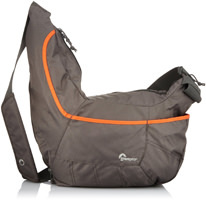 The Tamrac Aero Zoom 20 features a zipped top closure and has 2 velcro side pockets for extra small accessories. There is a handle on the top for ease of carrying plus an attachment loop on the back. 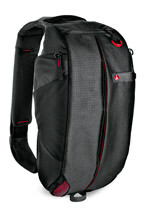 A shoulder strap is included and the bag features lots of padding for extra camera protection. The Manfrotto Stile VR Vivace has a soft lined interior and is available in a couple of different sizes depending on how much zoom tyour camera has. It's a stylish option and features a pocket on the front for small, thin accessories. It has anti-shock padding and comes with an adjustable shoulder strap. The top pocket has a zipped closure for extra security. 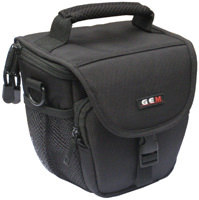 Gem make camera cases for a wide variety of cameras and are readily available online. This case will cater for most ultrazoom / bridge cameras and has a main zipped compartment as well as a zipped pocket on the front and internal / external mesh pockets. It has an adjustable shoulder strap as well as a belt loop. There is a carry handle on top and the top flap also clips shut for extra security. For your advanced compact (and by advanced compact we mean cameras that have large sensors and plenty of manual settings but in a compact and easily stowable body) you'll want something with lots of padding but that also has space for necessary extras like spare batteries and memory cards. It can sometimes be difficult to size up camera bags for your exact model as advanced compacts can vary considerably in size so the best thing to do is type your model name in when searching for bags. 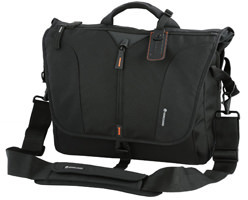 Manfrotto's active shoulder bag is a compact bag that's also feature packed, with special pockets for memory cards and 2 external zipped pockets. carry it on your shoulder or on your belt / bag. 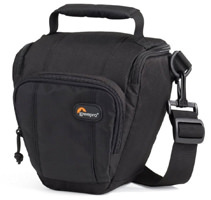 This bag has a nice large carry handle and the size is ideal fro stowing in a larger bag until the camera is needed. It also has built-in all-weather cover in case you get caught in the rain. 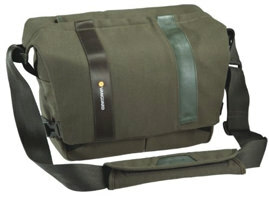 The Lowepro Portland 30 is the ideal size for Canon Powershot G series cameras and also has space for your mobile phone. It features a wrist strap, belt loop and another zipped pocket on the front for your small accessories. If you want to travel light then this is the advanced compact camera case for you. The Case Logic hard shell gives you an extra level of protection for your advanced compact camera if you're worried about it getting squashed or buried in a larger bag. It features a shoulder strap and dual zipping compartment with an elasticated pocket on the inside of the hard shell for small accessories. It has a plush soft interior. If you want something simple and easy to access for your mirrorless kit then these bags will be ideal. They're great if you just want to take your camera and perhaps some additional lenses. 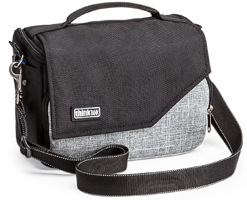 The Think Tank Urban Approach 10 is described as a low profile, high capacity camera bag designed specifically for mirrorless camera gear and a 10-inch tablet. It can fit a mirrorless body with lens attached and up to 3 additional lenses. It's the larger version of the two bags in the range, with the Urban Approach 5 shoulder bag holding 1-2 spare lenses and an 8-inch tablet. The bags are available in black with leather accents. IN our review, the Think Tank Urban Approach 10 received a 'Recommended' award for its professional looks, quality and comfort when on the move. The Scout SH series are stylish camera bags designed especially for mirrorless systems. They have a thickly padded interior and are available in 3 different sizes: SH100 to fit a mirrorless camera with lens attached and mobile phone, SH120 to fit mirrorless camera with standard lens attached plus mobile phone and extra zoom lens, and SH140 to fit mirrorless camera with lens attached, 2 zoom lenses and a small tablet. 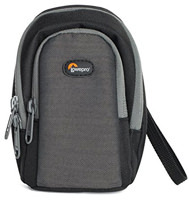 They feature a velcro front pocket and detachable shoulder strap. The Miggo Agua is fantastic if you want to head out and about no matter what the weather. 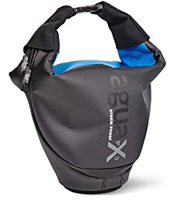 The bag is made from IPX-3 rain-proof tarpaulin which Miggo say can withstand water spraying up to 60 degrees from vertical at 10 liters per minute for 5 minutes at a pressure of 80-100kN/m2. It has a neoprene innard and the strap can be unclipped, allowing the bag to clip to itself for attaching to a larger rucksack. It's great if you're travelling light, with just your camera and an attached lens. This holster is ideal for travelling light with your small mirrorless camera and one extra lens. The holster comes with a detachable strap and it's easy to access your gear through the double-zippered top opening. There is also a large handle on the top. The Cullmann Stockholm Maxima 235+ is a small shoulder bag designed to hold a compact mirrorless or advanced compact camera along with a small tablet and accessories. Incorporating a Scandinavian minimalist design, Cullmann say it's a dual purpose photography and leisure bag that has plenty of pockets, a built-in rain cover and an adjustable strap. It's just large enough for your camera and a standard zoom lens, as well as your personal effects. If you don't want to change lenses and want to travel light, this bag will be ideal for you. For day trips out with your kit, you'll want something that has more space for your personal possessions that'll still keep your kit nice and safe. These bags have ample space for a mirrorless camera with lens attached and extra lenses/ flash modules as well as alcoves for your lunch, a waterproof coat and other possessions, too. The Manfrotto Pro Light Camera Sling Bag FastTrack-8 is designed for CSC shooters who can attach their camera to the adjustable camera strap then store their CSC in the sling without detaching it from the strap. It's perfect for CSCs such as the Sony Alpha A7 Mark III or Olympus OM-D EM-10 Mark II seen in the images below and has plenty of space for a CSC camera with lens attached, 2 additional lenses (e.g. a 70-200mm f/4 and 16-35mm f/4 in the main compartment), a tablet or laptop up to 9.7" in size and small accessories (memory cards, pens etc.). Plus, an internal bungee cord can secure a mini tripod and kit can be organised as you like thanks to the modular divider design found inside the camera bag. Tamrac's Hoodoo 20 has enough space for multiple lenses, a mirrorless body with a zoom lens attached plus there's also room for a 15-inch laptop and personal effects in the top compartment. Whilst the bag fits a lot, it also stays compact and stylish. It has a water resistant 2x PU coating and protective foam dividers are fully customisable to protect your gear. 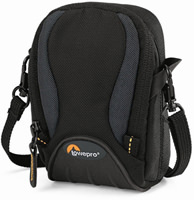 The Lowepro Passport Sling III features a pull out camera insert and lots of pockets and spaces for your personal belongings. Designed for travel, the bag also has an external zip allowing you to expand or compact the amount of room. 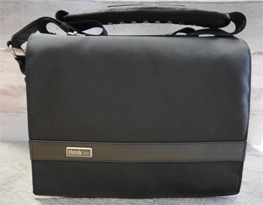 It has an adjustable padded strap and is great for when you want to take your kit along inconspicuously and comfortably. Think Tank's mirrorless mover range are custom made for mirrorless cameras and there are 5 different models available, capable of holding a mirrorless camera with attached lens and a mobile right up to 2 mirrorless bodies and up to 4 lenses with a tablet. The bags feature a magnetic closing flap to minimise noise and adjustable dividers inside so you can customise the bag to your kit. They also have a built-in all-weather rain cover. 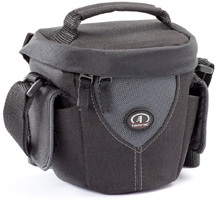 The Think Tank Urban Approach is an inconspicuous camera bag that holds a medium to large CSC camera with attached lens and up to 3 extra lenses including a zoom. It also has room for a 10 inch tablet and small accessories. With its included weatherproof cover, you can guarantee you gear's safety no matter what the weather throws at you. The Toploader Zoom will hold a DSLR with attached lens. There is also a built-in rain cover and a removable and adjustable shoulder strap. It's well padded to keep your camera safe and there's a front pocket for your small accessories. 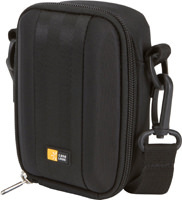 This bag can be worn around the waist and can hold an entry level DSLR with space for a mobile phone or filter in the back. It's very padded on the outside and inside so it causes you no problems when resting against your leg. There is also an adjustable shoulder strap, as well as an integrated rain cover. Vanguard's Vojo 22 is versatile and has a removable camera insert that can hold a DSLR with lens attached and extra lens. This allows you to use the bag as a holdall for your personal possessions when you're not out shooting, too. The bag has a built in rain cover and there is space for a tablet. 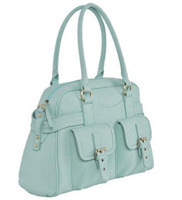 There is an adjustable shoulder strap with padding and loops for clipping extra things to the bag on the side. For a day trip out with your DSLR kit you'll want something comfortable, as kit can get heavy. These bags are ideal for if you have quite a lot of kit and want some space for your personal possessions too. For the lady photographer, this Jo Totes handbag-style camera bag is great if you want to carry your kit in town without people looking at your bag and thinking 'that's a camera bag'. 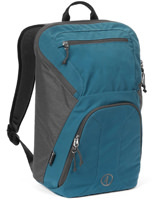 The bag also has a shoulder strap and has space for a DSLR with attached lens plus up to 4 extra lenses. There is also space for a 15-inch laptop, and magnetic closing pockets on the front for your smaller accessories. It's made from high-quality faux leather. The Aosta Interceptor range is available in 3 different sizes and is made from a waterproof, flexible tarpaulin material. The seams are glued rather than stitched to stop water leaking in there, too. 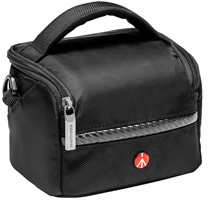 The medium bag can hold a DSLR and up to 2 lenses or accessories. 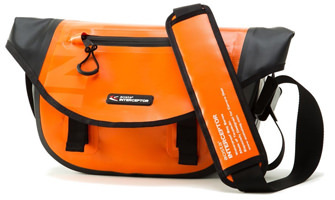 The bag is great for when you want to take your kit somewhere near a body of water or you want to go out in adverse conditions. 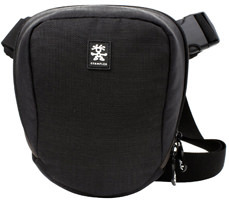 This stylish messenger is ideal if you're taking your camera kit into an urban environment. The on-trend grey outer fabric is moisture repellant plus there's space for a laptop and things you'll need for the day too. 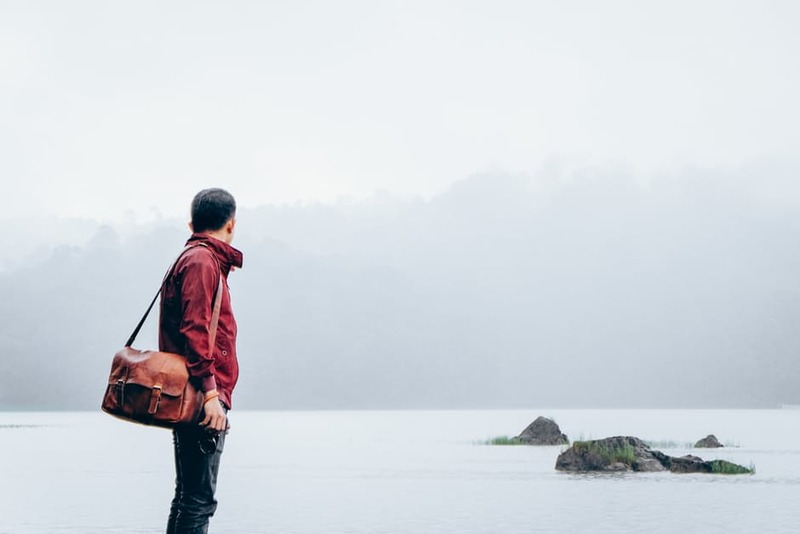 The bag uses flexi-pockets, which fold out allowing your to store your camera and lenses yet fold away to take up almost no space when you just want to use the bag for a day trip. If the messenger style is the one you like to rock and you need lots of space for all your kit when out and about, here's our pick of the bags you need to be looking at. If you want to add some luxury to your camera bag and budget constraints aren't a problem, then the ONA Union Street satchel is the ideal bag for you. Made from premium leather and waxed canvas fabric, the bag features antique brass hardware and has soft, removable inner dividers. 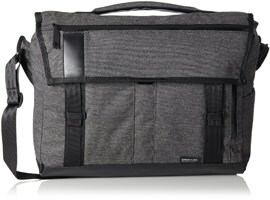 There is space for a laptop and the bag can hold a DSLR and up to 3 lenses. 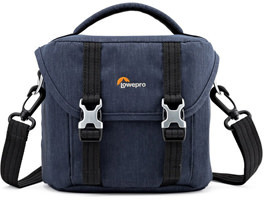 This Lowepro ProTactic shoulder bag is capable of holding a pro DSLR with attached zoom lens plus up to 2 lenses and a flashgun. It has a hard shell top, something that you don't often see on messenger bags, plus the ability to add optional extra pouches to the side of the bag by attaching them through the loops which cover the front and sides of the bag. There's also space for a 13 inch laptop and 10 inch tablet. 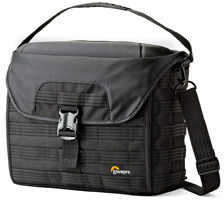 The UP-Rise II 38 messenger is another great choice if you need to carry a Pro DSLR and up to 5 lenses plus a flashgun. It has a built-in rain cover, and the kit insert can be pulled out should you wish to use the bag for pursuits other than photography. 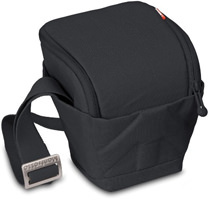 The bag is expandable and has an adjustable and padded camera strap. If you plan to do a lot of walking with your kit and don't need to have easy access for spur of the moment shots, then you might find a camera rucksack more comfortable. Tamrac's Corona range have the ability to be worn as a traditional rucksack or a sling style rucksack, allowing you to swing the pack around for easier access. They are capable of holding a DSLR with zoom lens plus up to 6 additional lenses and they also have a large space at the top of the bag for your personal accessories. Access can be gained from the sides and the front of the bag, giving you lots of access options. 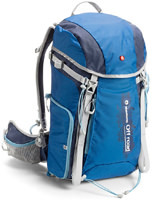 If you like heading off into the wilderness then the Manfrotto Off Road backpack will be ideal. It looks like a normal, bright walking daypack, so it's great for inconspicuously carrying camera gear. There's a mesh on the back to help you stay cool when wearing the bag in hot weather and it will hold a DSLR with attached 70-200mm lens plus an additional lens. The camera carrying section can be removed and zipped up safely if you want to use the bag for pursuits other than photography. Nest's Athena A70 backpack will be at home either in the city or in the countryside. The bag has room for a DSLR with lens attached and up to 4 extra lenses and it's made from high-quality 750D waterproof twill. There's a clip for your tripod on the side plus there are adjustable dividers and a space for your personal things at the top. The Dorr Combi 3-in-1 is a versatile backpack with a removable camera pouch which can be used as a shoulder bag, allowing you to use the rucksack for other pursuits. it can hold a DSLR with 2 additional lenses or a mirrorless kit as well as 13-inch laptop. It's made from lightweight, waterproof canvas. It's well padded and will prove useful for those that like to switch how they carry their kit. When you need to travel long distances with your camera, either on a plane or simply so that you can pick and choose the kit your take out with you when you reach your destination, a rolling camera bag or case could be a wise investment. The Lowepro Roller X100 AW case can hold up to 2 Pro DSLR bodies and up to 6 lenses. Basically a suitcase dedicated to your kit, it comes complete with movable dividers and a built in TSA approved lock. It's compatible with airline carry-on regulations (always check this with your specific carrier before you fly) and has a telescopic handle for ease of rolling. There is also a front zipped pocket. This rolling case comes with a front security cable and lock, allowing you to stow a laptop in the front of the rolling bag safely. It has a TSA zipper lock, which both of the main compartment zips clip into for extra security. It's designed to fit international carry-on size requirements but again we would always recommend checking this with your carrier before flying. It can hold up to 2 DSLR bodies, a 70-200mm zoom lens, up to 4 other lenses and a flashgun, plus room for smaller accessories. The Vanguard Xcenior 62T can hold a laptop of up to 17 inches and features thick padding to cradle your gear. A tripod can also be attached to the front, and the bag can hold 2 Pro bodies with attached lenses, with room for another 5 or 6 lenses plus accessories. The padded gear insert can be removed, allowing you to use the bag as a normal suitcase too. It comes with a Vanguard combination lock. The Tenba Roadie Air Case Roller 20 is airline carry-on compatible (always check weight restrictions with your carrier before travel) and is super tough, with an inner frame that makes it capable of being shipped without harm coming to your kit. It can be stood on, sat on, kicked and crushed and still keep your gear safe. One for the safety conscious, it comes with TSA zip combination locks and a security cable to attach it to immovable objects. Capable of holding 2 Pro DSLR bodies and up to 8 lenses of 400mm, you should have no trouble fitting your pro kit into it. There seems to be no company jumping on the Hiking/photography train. The off road from Manfrotto is close, but not ideal. I want an F-stop as it meets every requirement, but we all know their famous stock/delivery issues! There seems to be no company jumping on the Hiking/photography train. The off road from Manfrotto is close, but not ideal. I want an F-stop as it meets every requirement, but we all know their famous stock/delivery issues! Quote:I want an F-stop as it meets every requirement, but we all know their famous stock/delivery issues! [quote] And nowhere to buy it from here in England :([/quote] Well I know of one company. Paramo-clothing. But they have very little stock. Well I know of one company. Paramo-clothing. But they have very little stock. From my research, the F-Stop seems to be the best quality bag ... but ... at a price!